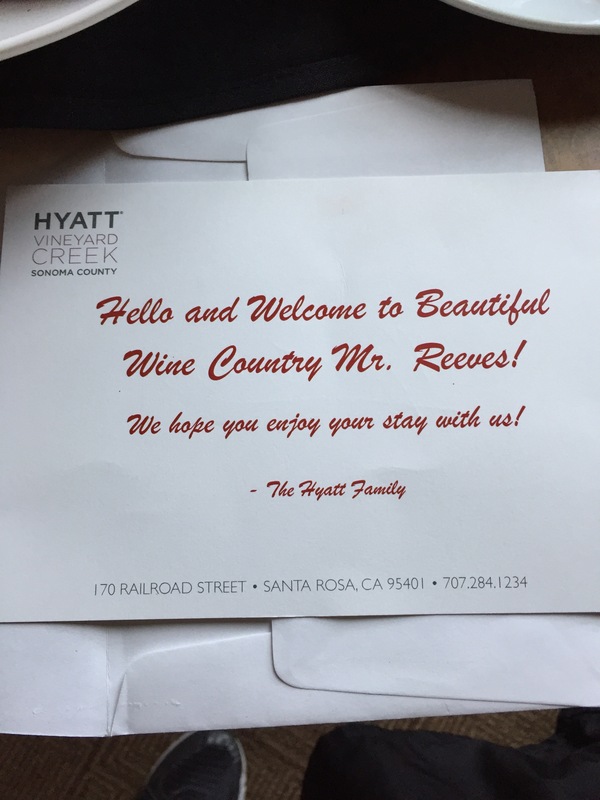 I booked the Hyatt Vineyard Creek for my wife and I on Hyatt.com about a month before our trip to San Francisco. 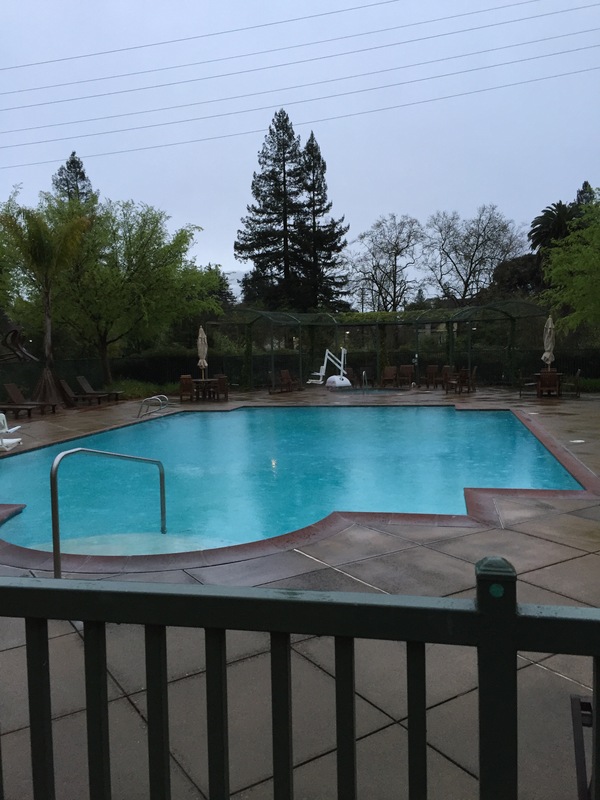 There were two Hyatt options in wine country. 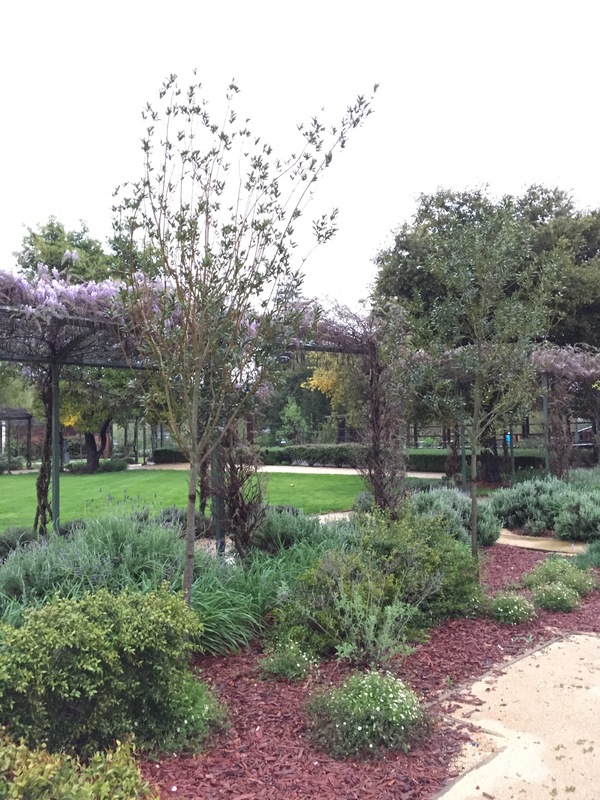 One was the Andaz which priced around $230 a night or the Hyatt Vineyard Creek which priced at $190 a night. Both hotels looked good from the webpage. Based on my prior experience with Hyatt as well as the lower nightly cost, I selected the Vineyard Creek location. I am a Hyatt Diamond; however, there is some qwirk on Hyatt.com that initially makes all my reservations show up as Platinum. Every time I reach out to Hyatt via twitter to try to get it resolved and they don’t seem to have a solution on it. As it got closer to the check in date, I reviewed Hyatt.com for price changes and I noted that the Hyatt Vineyard Creek went down to $150 a night, while the Andaz was sold out. So I placed a new reservation for the lower rate and I cancelled the first one. The status again showed as Platinum so I reached out to Hyatt via Twitter and they said it was showing Diamond on their side and they apologized about it. My wife and I used our Silvercar rental to drive to the hotel. It took about two hours to go from SFO to Santa Rosa, which is where the hotel is located. Upon arrival at the hotel, we discovered that it was under renovation. The drive up area was closed and their was a temporary entrance to the side. We found a parking spot and entered the hotel. Upon arrival at the front desk, there were two colleagues present and one other guest was being assisted. One of the colleagues invited me to the desk and he offered assistance. I requested to check in and he asked for my name. I provided it and he thanked me, used my name and located my reservation. The colleague thanked me for being a Platinum member. I thanked him and said that I was actually a Diamond member and that there was a qwirk in the system. I asked if he could “Refresh” my Hyatt number and when he did he saw that I was Diamond. The colleague apologized and he confirmed the benefits I would get as a Diamond member. The colleague was polite. He said that they did not have any upgraded rooms available but he found a nice room for us that was a standard king room on the top floor. The colleague processed my payment and he offered a choice of amenities for the room. The colleague suggested the local wine as it was better than the standard Hyatt Canvas wines. He also said I could select a food item as well and he presented a paper that offered the selection. The colleague offered luggage assistance. He also informed us that we could have breakfast in the restaurant and to sign it to the room and they would cover the breakfast for two each morning plus a 19% gratuity. The colleague thanked us sincerely and he wished us a good stay. 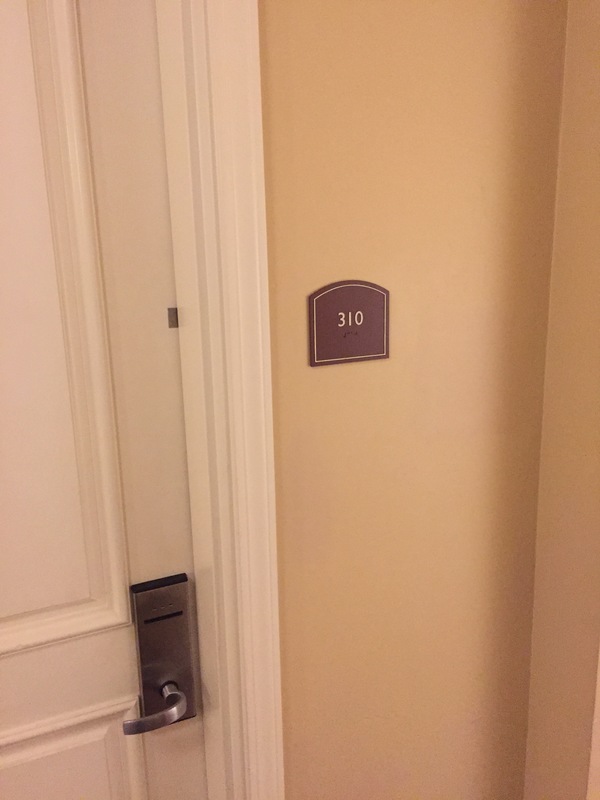 We were originally assigned room 310. Due to the renovations in the hotel, there was a decent length walk to get to the room from the elevator bank. When we arrived in the room, we noticed a strong musky odor and the room. I returned to the front desk and the and colleague greeted me and he offered assistance. I informed him about the smell in the room and he apologized and he immediately offered to give us a different room. I accepted and he said the room next to ours was available and he issued keys for that room. The colleague asked if he could assist us with moving our luggage. I said that was not necessary. He thanked me and said he wanted to make sure that we enjoyed our stay so he hoped that the new room would be better. The new room was room 308. I utilized the key card to access the room and the door opened without issue. The room was a standard king size bed room. It also featured a small desk, dresser with television and a view of the courtyard. 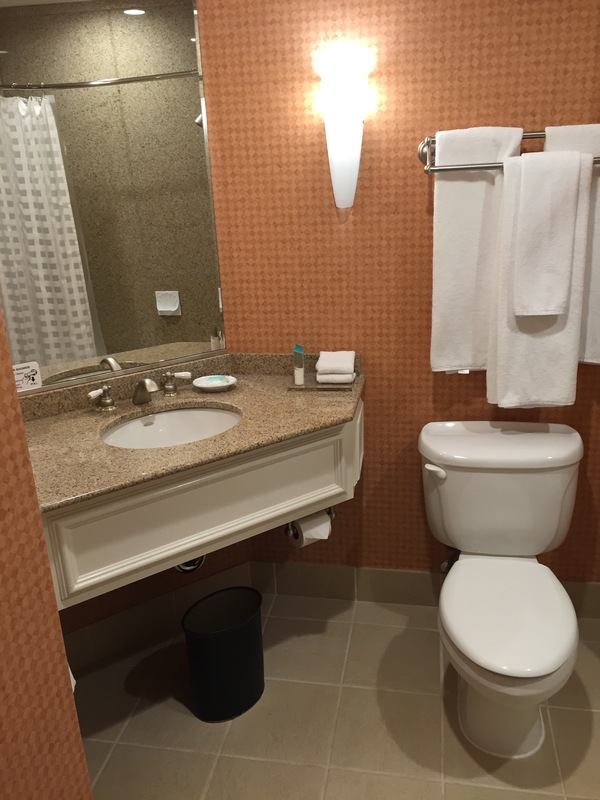 The bathroom featured a shower and bath tub combination and a small sink and vanity area. 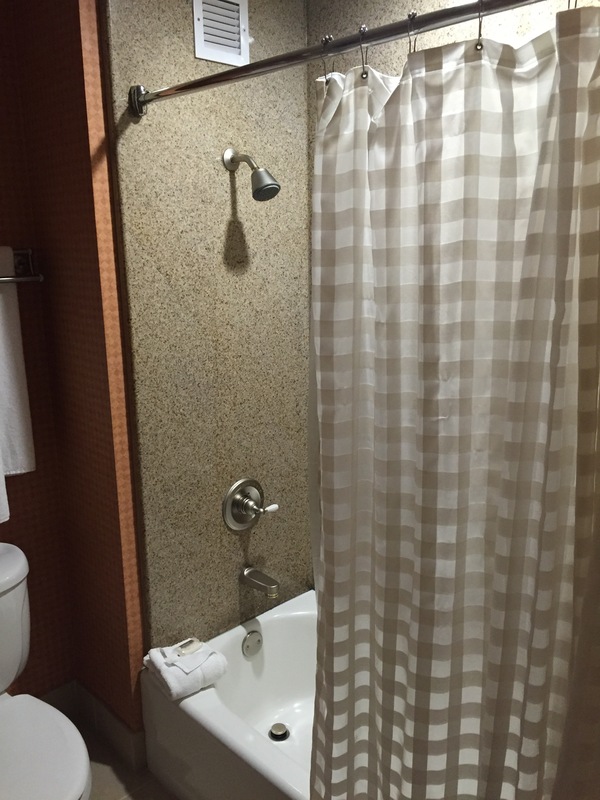 The shower head was very low so my wife and I both had to duck down in order to utilize it during the stay. The room was clean overall; however, it was dated. 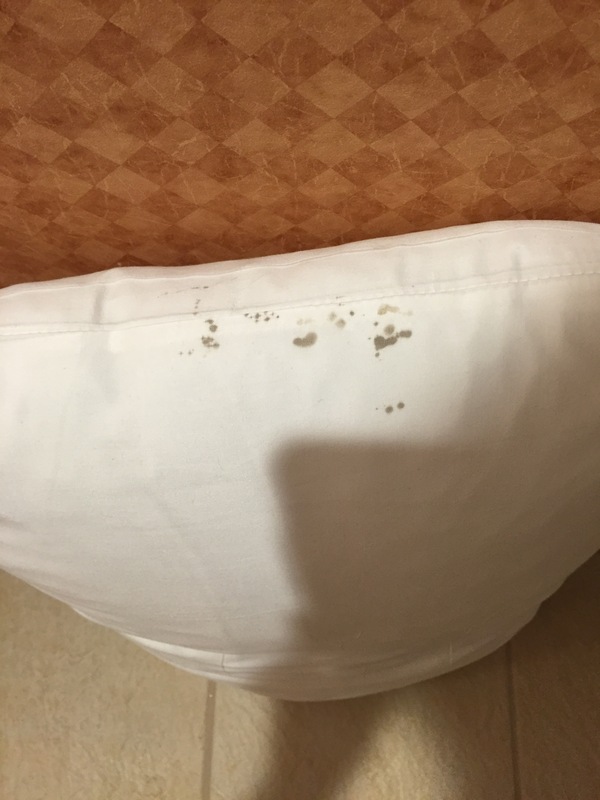 We discovered mold or mildew on the wall in the bathroom as well as on one of the pillows. We did not want to deal with changing rooms again that evening so we let the issue go until the morning. The room had several dents in the wall and other defects which showed the age of the room. 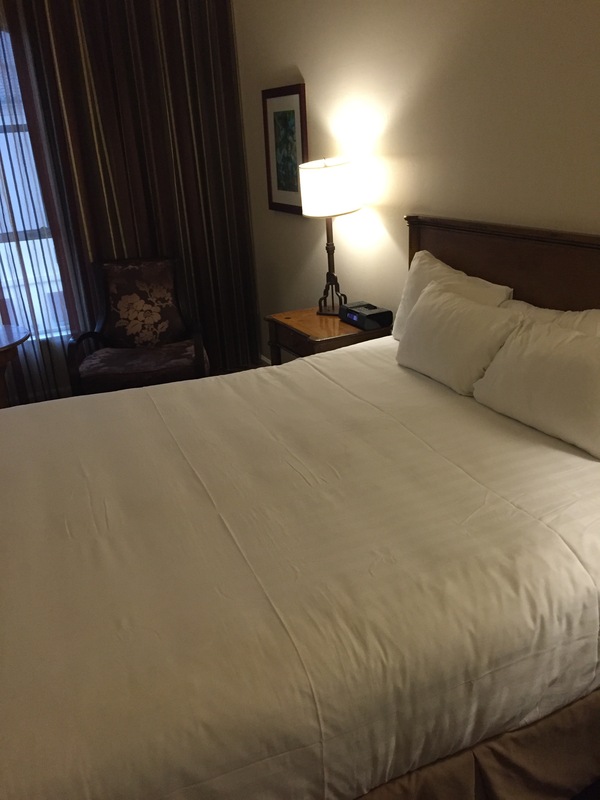 Except for the pillow with the mildew on it, the other linens were clean. The towels in the bathroom were quite thin. The bath amenities were the standard Hyatt products; however, no body wash was provided in the room. In addition, there were no complimentary water bottles in the room. Only ones for purchase for $4. The room did not feature any wine glasses, wine opener or bottle opener even though the hotel was in wine country. A wine opener was available from the front desk. A welcome amenity was delivered to the room shortly after we arrived. We requested wine and cheese and had requested the local Sauvignon Blanc. Initially, a bottle of red wine was delivered. My wife informed the server about it and he quickly returned with the correct type. The amenity included a small plate with four small cheese offers. One was a blue cheese and the other were small pieces of white and yellow cheese. In addition, fruit was offered on the plate as well as nuts. The fruit was fresh and it had a good taste. A few peppers were also present on the plate. The peppers were salty. The dish was presented attractively. The portion size was on the small side. The wine was served chilled. It was a local Sauvignon Blanc which had a smooth taste. I found a bottle at a local store for about $10. The room was quiet throughout the stay. The air conditioning did not work that well and we had the setting at 65; however, the temperature felt to be around 70. On the first morning, I reached out to Hyatt via twitter to complain about the room. They immediately replied back to me and they said that someone from the hotel would call me to resolve the issue. I received a call about two minutes later from the hotel manager. He apologized about the issue and he thanked me for bringing it to his attention. The colleague asked if he could walk the room that morning and have the issues corrected while we were out of the room. He also said we could move to a different room. I said we had already moved one room the night before and would prefer to not have to do that as long as the air conditioning could be repaired. The colleague thanked me and he said he would personally take care of the issue that day. 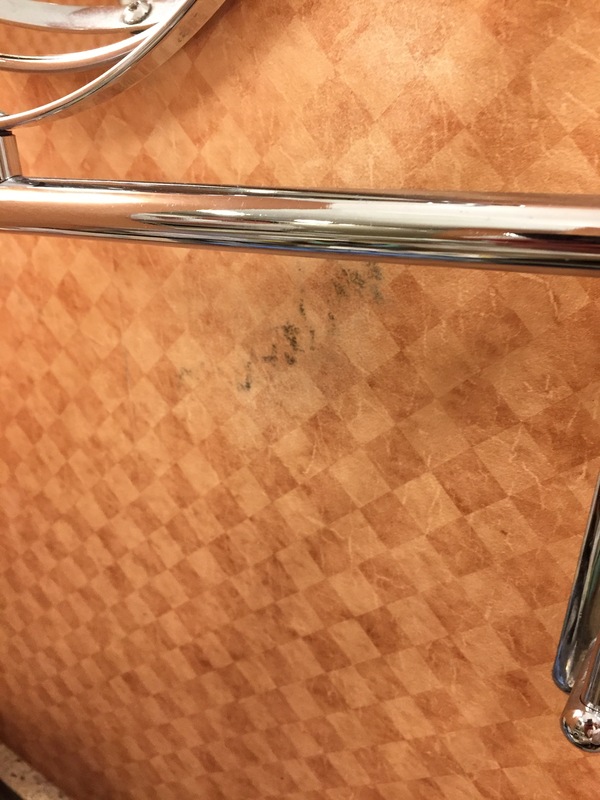 We departed the room for the day and when we returned we found that the pillow with the mildew was removed and the wall in the bathroom was cleaned. The air conditioning appeared to work a little better as well. 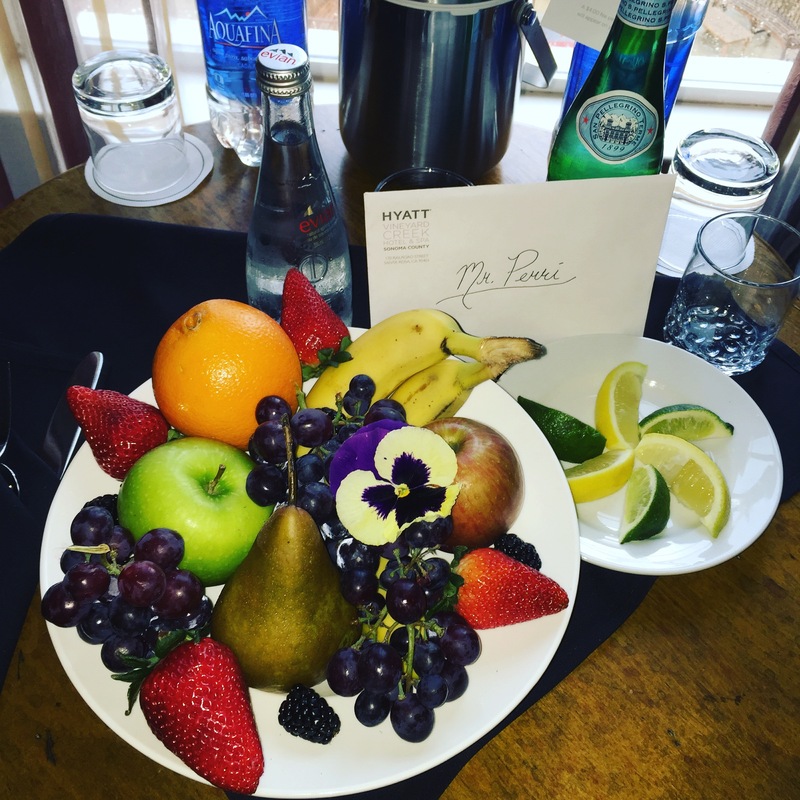 In addition, we found another amenity which was a large fruit plate with a bottle of Evian water as well as S. Pellegrino water. There was also a note attached in a card. The fruit plate was large and it featured large strawberries, grapes, apples, orange and two bananas. All of the fruit was fresh and it had a sweet taste and was excellent. Two glasses were provided with the water as well as a plate of limes and lemons. The S. Pellegrino Water was in a bottle with a standard bottle top. There was no bottle opener in the room so I was unable to open the water. I requested one from the front desk; however, it was never delivered to the room. The card was hand addressed on the outside with my name on it; however, the inside card was typed and it was addressed to another guest. My wife and I had breakfast in the restaurant both mornings. The restaurant was accessed via an uncovered outdoor walkway. The hotel offered umbrellas for use during the stay as it was raining. When we arrived the first morning, a colleague greeted us at the host stand and she welcomed us and offered to seat us immediately. The hostess provided menus and she said the server would be with us shortly. Within a minute or two, the server arrived at the table and she welcomed us. The sever offered beverages. My wife requested a Diet Coke. The colleague asked if Diet Pepsi was okay. My wife declined, and she requested Tomato juice and water. I requested a cappuccino and orange juice. The colleague thanked me. I inquired what meal options were available for a Diamond member. The colleague informed me that we could order anything off of the menu. She said to sign it to the room and the hotel would cover the charges. 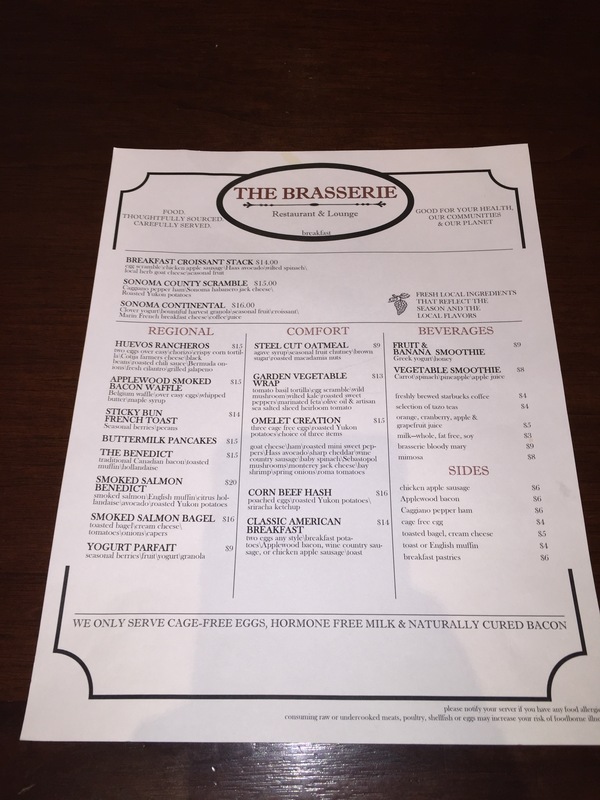 The menus were clean and they offered a variety of options. The server returned a few minutes later with the juice as well as the cappuccino. 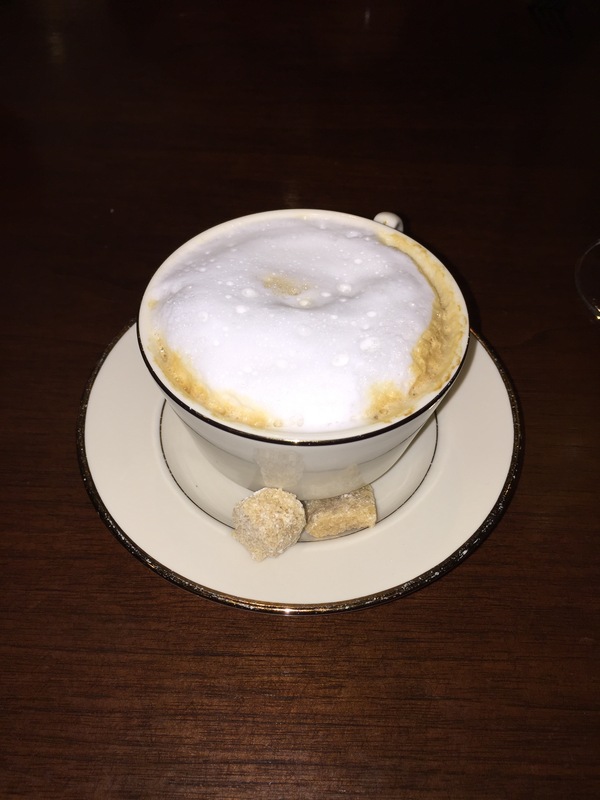 The cappuccino was served with a sugar cube. The server asked if we were ready to order. We accepted and my wife ordered an omelet. The colleague asked her what type of toast she wanted and she confirmed the toppings for the omelet. My wife requested wheat toast and the colleague thanked her. 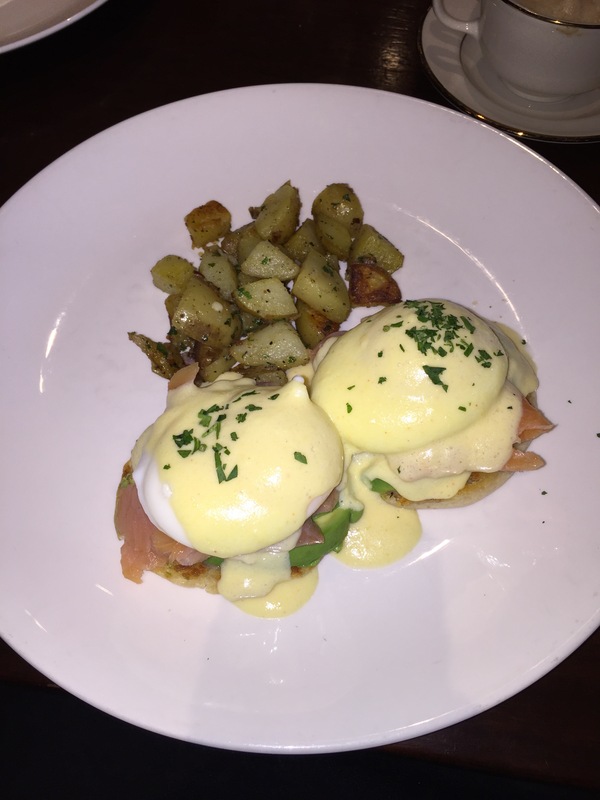 I ordered the salmon benedict and she thanked me. She asked if we wanted anything else. I requested a side order of bacon to share for the table. The colleague thanked us and she said it would be ready shortly. Within 10 minute of ordering, the colleague returned to the table and she presented the breakfast. She also refilled our water glasses. The colleague asked us to enjoy. She also checked back with us a few times during the meal. The omelet was served hot. The omelet was fresh and it was large and it was made with three eggs that were fluffy. The toppings were excellent and they all tasted fresh and had an excellent flavor. The omelet was served with breakfast potatoes that were golden brown and they were seasoned well. The toast was served on the side and it was golden brown and had a fresh taste. Warmed butter was served with it that was creamy. The portion size of the entrée was large and it was presented attractively. The salmon benedict was also served hot. The dish was served with two large English muffins which were topped with a generous portion of salmon topped with spinach, avocado and two perfectly poached eggs. The eggs were topped with a rich sauce and they were garnished neatly. The salmon was fresh and the vegetables had an excellent taste. The eggs were also fresh and they had an excellent flavor. The dish was served with breakfast potatoes that were also fresh. The portion size was generous and it was presented attractively. 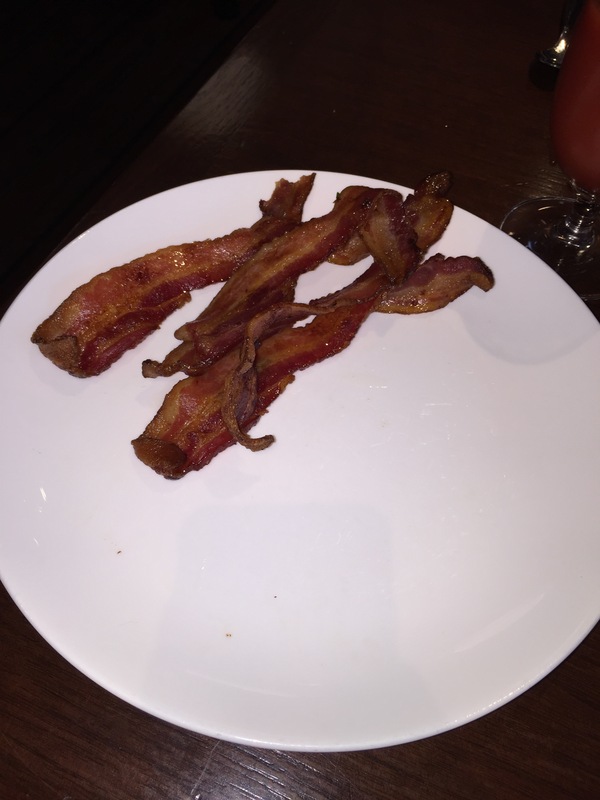 The bacon was served hot on a large plate. A generous serving was provided. The bacon was thick cut and it had an excellent taste and flavor. The tomato juice was fresh and it was served chilled. The orange juice was also served chilled and it tasted fresh squeezed. The cappuccino was served hot. It had a creamy taste and the espresso was good. The rock sugar was a nice addition to the beverage. After we finished the breakfast, the server returned and inquired about the meal. She offered to remove the used dishes and we accepted. The server thanked us and she asked if we needed anything else. After we declined, she presented the check in a clean folder with a pen. The check was $65. I added a tip and signed it to the room. The colleague picked it up and she thanked us and she wished us a good day. On the second morning, my wife and I returned to the restaurant. A colleague greeted us at the front door and she asked if we wanted to sit in the lounge or in the restaurant. My wife requested a regular table. The colleague thanked us and she assisted us with seating and presented menus. The menu that morning was different as it was for brunch. There were some of the same breakfast offerings as well as lunch items including a seafood pasta, pizza, burgers and other items. A server greeted us within a minute and offered beverages after welcoming us. My wife ordered a tomato juice and I requested cappuccino and orange juice. I also asked if there were any exceptions from the menu that were not included for Diamond members. The colleague said no and that I could order whatever I preferred. The server returned a minute or two later with the juice and she said she would have the cappuccino shortly. She thanked us and she asked if we were ready to order. My wife requested biscuits and gravy as well as the goat cheese dip to share. The server thanked her and she asked me what I wanted. I requested the seafood pasta. She thanked me and she asked if I would like French bread with it. I accepted and she thanked me. The server returned a minute later and served the cappuccino. This time no sugar cube was provided. The entrees were served about 10 minutes later. When she served the goat cheese mixture she offered small plates for sharing. My wife and I accepted and she presented them and asked us to enjoy. 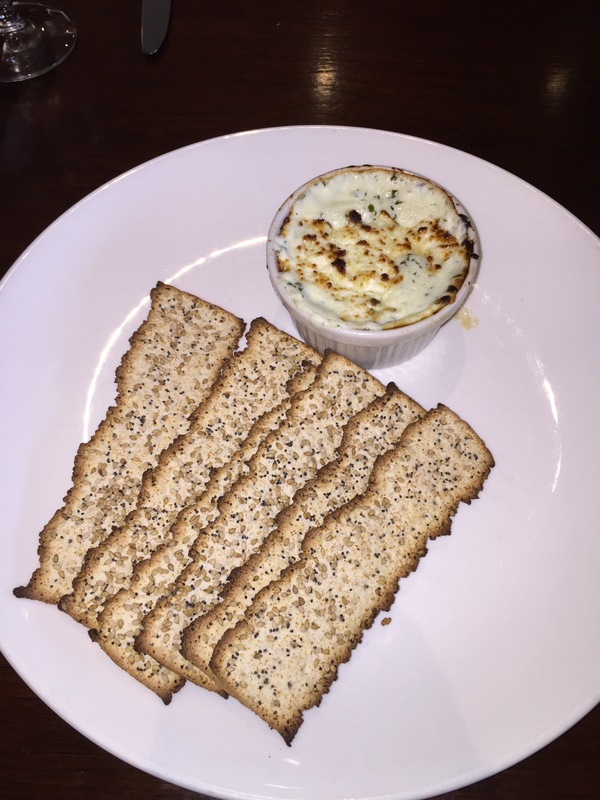 The goat cheese dip was served hot. It was presented on a plate with crackers. The crackers were crispy and they had a good taste. The goat cheese was rich and creamy and it had a lot of flavor. It was an excellent dish. The biscuits and gravy was also served hot. The biscuits were large; however, they were not flaky. The biscuits were topped with a gravy with sausage. The gravy had a good taste; however, the level of gravy was somewhat small. The dish was served with two eggs that were cooked over easy. The eggs were fresh and it had a good taste. The portion size was medium. It was presented neatly on the plate. The seafood pasta was served hot. 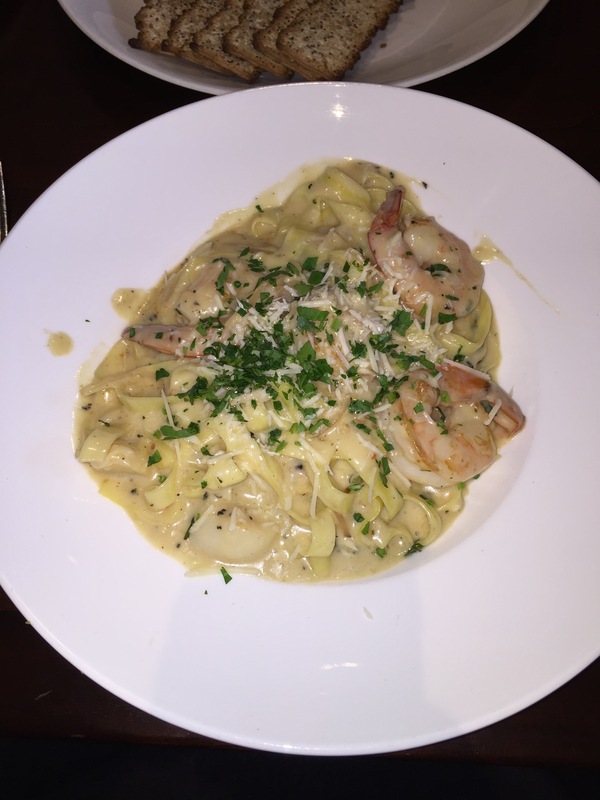 It consisted of fresh fettuccini noodles that were cooked in a creamy sauce with scallops. There were three large shrimp served on top of it. The sauce was tangy and it had an excellent flavor. The scallops were fresh and they were cooked well and had a good taste. The shrimp was also fresh and it had an excellent taste. The portion size was generous. The juice was both fresh and they had a good taste. The cappuccino also had a good taste and flavor. The server checked back with us a few times during the meal and she kept our water glasses full. When we were finished with the meal, the server returned and she cleared our used dishes. The server asked if we wanted anything else. When we declined, she presented the check in a clean folder with a pen. The check was around $85 before tip. I signed it to the room and when we were departing the server thanked us and she wished us a good day. The hotel public areas were clean. They offered a pool as well as a courtyard. The pathways to get to each had some renovations and there were signs throughout the hotel directing guests to where they need to go. 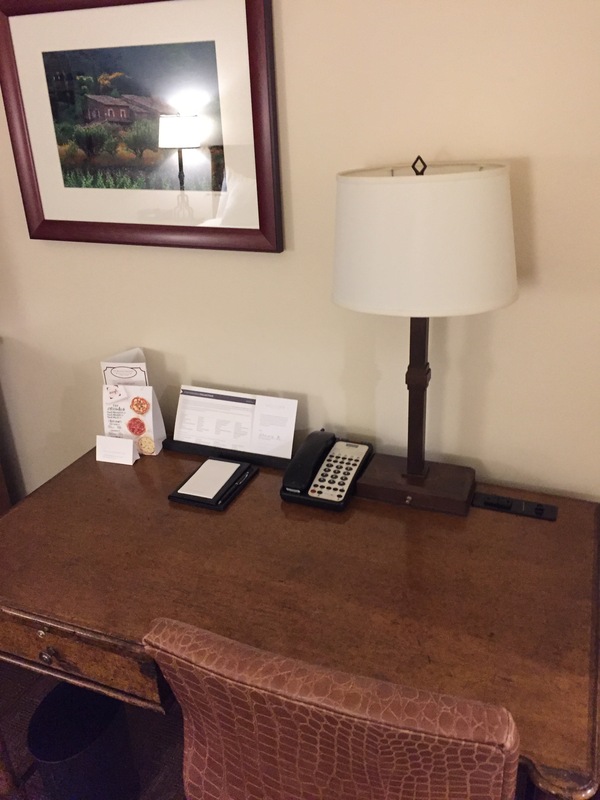 When my wife and I were ready to check out, we approached the front desk and one colleague was present and two other guests were waiting. The colleague made eye contact with us and greeted us and said he would be with us shortly. After about three minutes, the colleague invited us to the desk and he offered assistance. I requested to check out and provided my key card. The colleague thanked me and he used my name and introduced himself. He informed me that he was the manager that talked with me the previous day. The manager apologized about the issues in the room. He informed us that he saw what we were talking about and he felt bad that we experienced that. I said we received the fruit the night before and I thanked him for it. The colleague provided his business card and he said he would love to have us back to the hotel in the future and he asked me to send him an email and he would set us up with an upgraded room. I thanked him and he was sincere in his apology. The colleague reviewed the charges with me and he confirmed the method of payment. The colleague offered to send the email receipt to me. I accepted and he verified my email address. The colleague thanked us for staying at the hotel and he asked us to return. He asked if he could assist us with luggage. I said that was not necessary. I mentioned that it would be helpful to inform the person that delivered the amenity to be sure to leave a bottle opener as I was unable to open our bottle of S. Pellegrino water. The colleague thanked me for the comment. He wished us a good day. We departed the hotel via car. We were underwhelmed with this Hyatt property. The hotel felt run down. It will be nice once the renovations are complete. 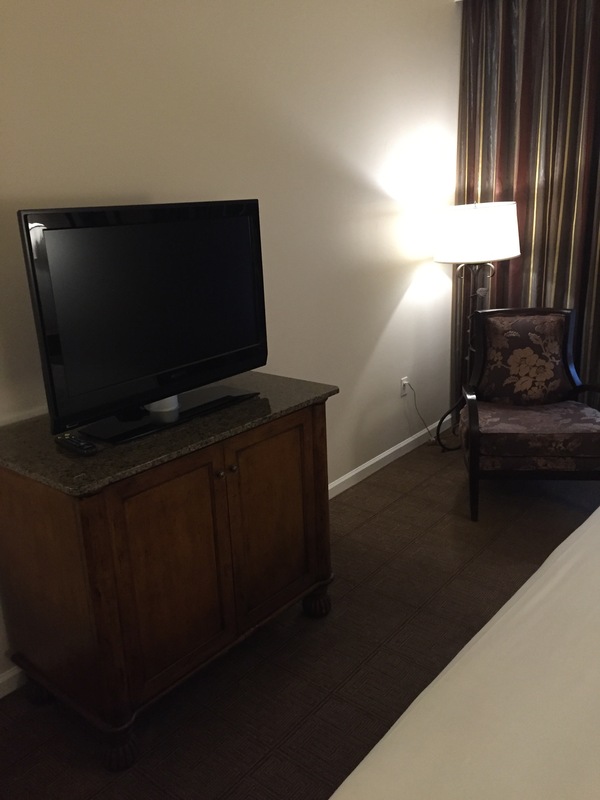 The hotel lacked small details which would have made the experience better. 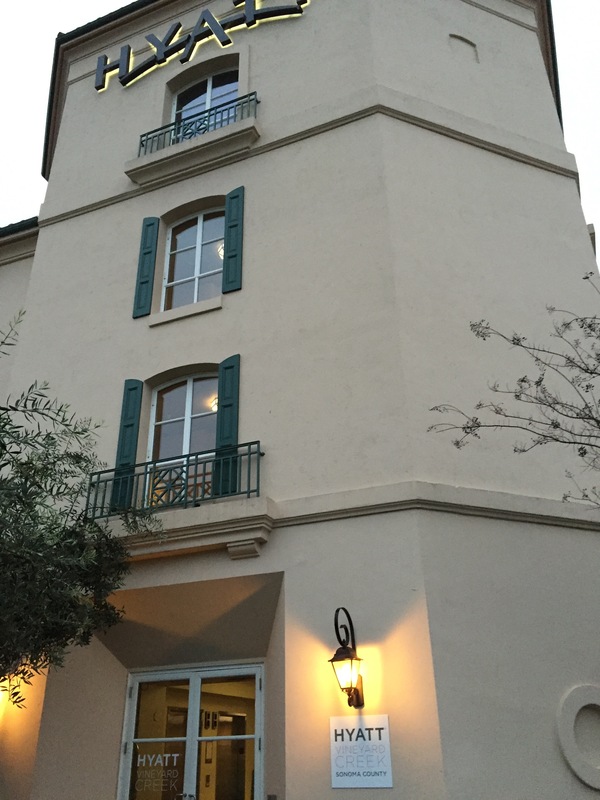 For example, this is a hotel in wine country; however, the room did not feature wine glasses or a wine opener. That is a simple fix but it would add a lot to the experience. The colleagues I interacted with at the front desk were friendly and polite and they seemed happy to assist me. When I brought up the issues they seemed sincere in their apology and I felt that it was nice that they followed up with the amenity as well as the personal interaction at check out.